The Stihl FS56 C-E is one of the new generation, light-weight petrol brushcutter with straight shaft, bike handle and ErgoStart. Modern appearance, convenient operation and very simple starting procedure are the highlights of the new generation STIHL grass trimmer range. Reduced-emission engine technology - 2-stroke engine with stratified charge. A fuel-free layer of air is created between the burned charge in the combustion chamber and the fresh charge in the crankcase, reducing the amount of fuel lost during the charge cycle. This results in more power with a lower weight, up to 20% lower fuel consumption than regular 2-stroke engines and significantly reduced exhaust emissions. Manual fuel pump (Purger) - A small fuel pump delivers fuel to the carburettor at the touch of a button. This reduces the number of starting strokes required following extended breaks in operations. 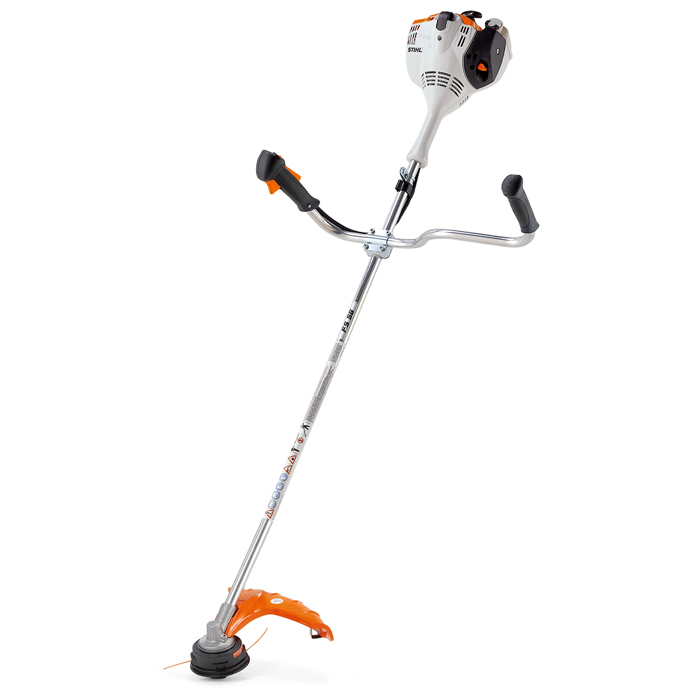 STIHL ErgoStart (E) - STIHL ErgoStart cuts the effort required to start the tool by half, while the starter cord can be pulled at just one third of the normal force. A coil spring between the starter cord and the crankshaft smoothes out force peaks, making them virtually undetectable through the cord itself. Simplified starting system - Simply set the choke, pump the fuel primer, pull the starter cord and away you go! The running machine then switches off after a brief press of the stop button. Once the machine is at a standstill, the ignition activates again automatically. Thus the ignition is always ready for starting. Bike handle - When used in conjunction with a harness, the bike handle enables a smooth mowing action. The bike handle allows the machine to be easily guided, making it ideal for working on large areas and thus reducing fatigue. - Spare Oregon 2.0mm Starline to fit this machine. 15m in length ideal for a straight refill of head, longer lengths are available on request. Please call for prices. This Machine will be fully PDI'd prior to delivery to Stihls exact Pre Delivery Inspection checklist, ensuring you receive a working machine.